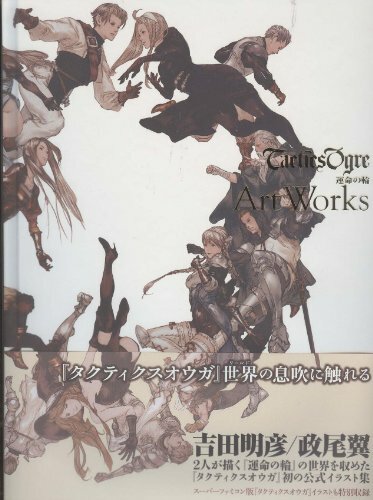 This is the art book for the PSP game タクティクスオウガ 運命の輪 (Tactics Ogre: The Wheel of Fortune). In Japan, the game title is Tactics Ogre: Let Us Cling Together. It's a 232-page hardcover book that comes with a nice translucent dust jacket with the book title printed on it. This is primarily a character design book. The illustration and character style reminds me very much of those from Valkryie Profile, also a role-playing game. The artists here are 政尾翼 (Tsubasa Masao) and 吉田明彦 (Akihiko Yoshida). Every character comes with a completed full page illustration, with the sketches and linework in another section of the book. The character designs are very nice. The costumes and colouring are beautiful. I think they are pencil sketched and coloured with poster colour. Masao provides comments for all the characters. Creature and enemy designs are lacking. For the few included, they are nicely illustrated, but the concepts aren't unique enough. I don't know what the game is about so I can't really tell what's missing. The environment art are just screenshots from the game, I think. The other art included are just of the flags, logos, and some scene paintings. At the end are interviews with the two creators, in Japanese of course. Recommended to those who like fantasy character designs. Just picked up this book at Kinkokiniya New York, The book is great, I could have used more moster art, and some of the pictures have digital color that just doesn't look as nice as the more traditional stuff. BUT i am a huge Akihiko Yoshida fan and since I have never seen a Vagrant Story art book or Final Fantasy Tactics one, this scratches a huge itch. Here are more creature design art books. Just purchased this book via amazon japan. Waiting for it until August 27.